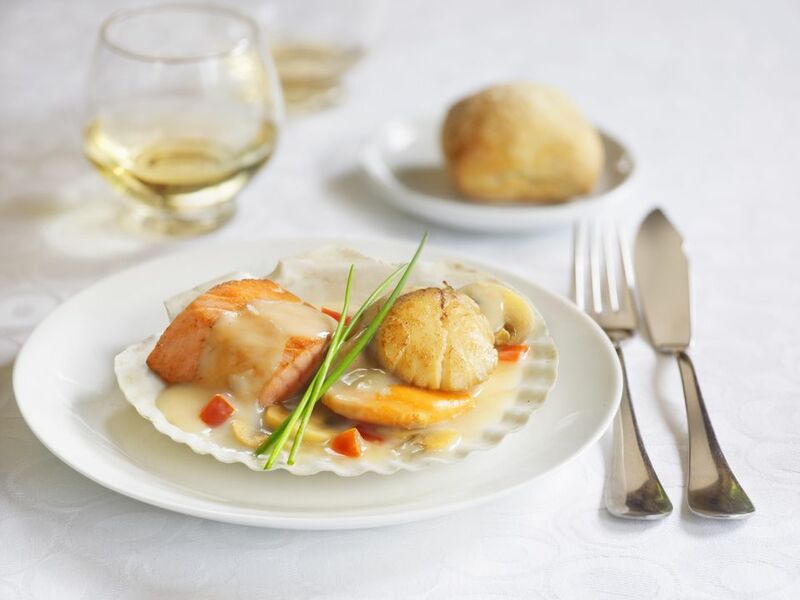 Scallops are one of the firm favorites of the French kitchen and loved throughout the country. There aremany ways of cooking them from the simplest of pan-fried in butter, or simply oven baked to dishes such as this Scallops L'Orange. Guests will love this seafood focused twist on a French classic. A Grand Marnier sauce is laced with sautéed shallots with a touch of crème fraiche added to enliven the seared scallops. Preheat a large skillet over medium-high heat. Melt the butter in the skillet until lightly foaming but not burning. Lightly season the scallops with salt and black pepper and sauté them in the skillet for 2 minutes on each side taking care not to overcook them, they should still be soft to the touch when pressed in the center. Reduce the heat to medium and sauté the chopped shallots in the skillet for 4 minutes. Add the Grand Marnier, orange juice, and crème fraiche to the pan and allow the mixture to simmer for 4 minutes until it thickens a bit. Remove the orange cream sauce from the heat and add a few of the diced tomato pieces and stir gently. Drizzle the orange cream and tomatoes onto a warm serving plate, arrange a small amount of haricot vert in a spiral shape in the center of the plate and then arrange a few scallops around the green beans or serve them simply on the side. Garnish with chives and serve immediately. Scallops cannot be cooked in advance, so this dish is made last minute and served at once to get the maximum flavor and to enjoy the soft texture of the scallop. This seared scallops in orange cream sauce recipe make four servings. Vary the flavors by switching out the Grand Marnier for Cognac and omit the orange.